Opies Gifts will have reversible aprons, scarves, hats, shawls, and bracelets. Also they will have adult blankets as well as their baby blankets, burp cloths, wristlets and pouches. J&W will be there with their wonderful produce again. Get there early for cantaloupe which are starting to wind down. It’s a Natural Farm will be there with their organic Chicken and Alpaca Products. Phillips Organic will have the last of their garlic, rainbow Swiss chard, spaghetti squash and lots of Heirloom tomatoes Yum!! Also Hill ‘n Hallow vinegars. Nice Farms will have Canadian harmony freestone peaches,blueberries, strawberries, eggs, Zestar Apples, tomatoes, maple syrup and maple products. Also at the market tomorrow: Mackenzie Farms with corn, Peg’s Produce with cut flowers and other yummies, Mellander Maple with their maple products, Once Again Nut Butters, and Nunda Mustards and Dave the Honey Guy with all of his honey products including allergy relief honey. Our entertainment will be the LeRoy Town Band, always a fan favorite and Cornell Cooperative Extension’s Master Gardeners will be in our community booth. Thank you for supporting our little market. See you in the morning! Hello all It’s going to be another hot one tomorrow! What a great opportunity to enjoy our market under the shade of the trees in Trigon Park! Here are a few of the highlights of what is being offered tomorrow morning. Opies Gifts will be there with new aprons, and dish cloth wreaths, scarves and shawls and new paracord bracelet colors. Phillips Organic will have Organic heirloom tomatoes, spaghetti squash, garlic, greens, and cucumbers plus flavored vinegars from Hill ‘n Hollow. J&W will be there with watermelon and cantaloupe in addition to all of their usual veggies. Mellander Maple, Nice Farms, Mackenzie Farms, Dave the Honey Guy and It’s a Natural Farm will also be there this week. Peg’s Produce will be there NEXT week. Peg’s son is getting married tomorrow and we would like to congratulate her and her entire family on the happy occasion! In the Community Booth you will find the Oatka Creek Watershed Committee and Denise Duthe will be playing her harp as our entertainment. Thank you for supporting our little market. See you tomorrow! Here is what is happening at the market tomorrow. Opies Gifts will be there with baby blankets, burp cloths, pouches, scarves, paracord bracelets, and more. Mellander Maple will be there with their maple products also Once Again Nut Butters with samples of sunflower, almond, cashew and organic peanut butters. Nunda Mustards too! 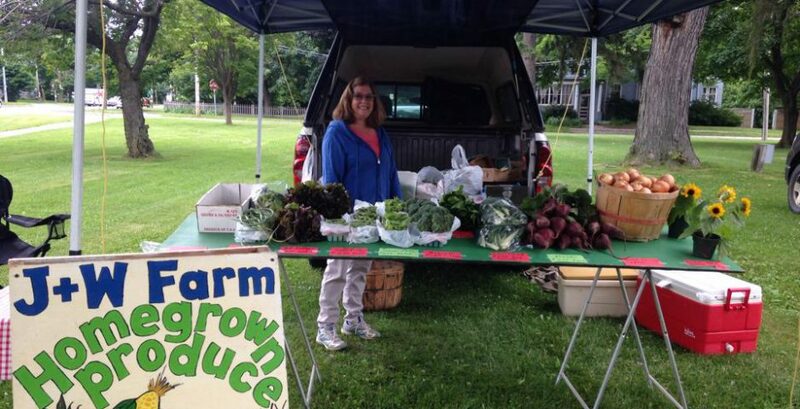 J&W Farm will have their own homegrown cantalope and lots of other yummy veggies including fresh corn. Nice Fruit Farms, Mackenzie Farms and Dave the Honey Guy will all be there. Our entertainment for the week is Bev Hess and the Cornell Master Gardeners will be in our community booth. See you at the Market rain or shine! Good Morning! I can’t believe it is August already! Peg’s produce will have bouquets and cut flowers for “make your own” bouquets, wreaths, soap, garlic, onions, squash and green beans. Dave the Honey Guy will have his full line of honey products including Vicky’s natural lip balms in plain, cherry and spearmint flavors and 2 sizes of body butter in unscented and lilac. Phillips Organic will have certified organic hard neck garlic, mixed salad greens, swiss chard, cucumbers, and Hill n Hallow vinegars. J & W Farms will have sweet corn, tomatoes, green beans, watermelons, onions, potatoes and more. A new vendor this week is Ashley Cross of Little Fox Fauxs. Ashley will be bringing wall art, crocheted items, baby bibs, pebble art and wooden goods that are handmade by her. Let’s give her a big welcome! Nice Farms, Mellander Maple, Mackenzie Farms will all be there this week as well. Our entertainment this week is a small group made up of musicians from the LeRoy Town Band called Just Playin’ Folks. And in our Manager’s tent this week is Author and business owner Tracy Mortorana who will be there to sign copies of her book “90 Days to Holistic Wellness”. As I get more updates I will share them with you. See you at the market!